Till forth gushes—rewarding my tap, tap, tap! The food of us Suckers—the rich, juicy sap. ANY wild birds run up and down trees, and it seems to make little difference which end up they are temporarily, skirmishing ever to the right and left, whacking the bark with their bills, then quiet a brief moment, and again skirmishing around the tree. Sometimes an apple tree, says a recent writer, will have a perfect circle, not seldom several rings or holes round the tree—holes as large as a buck shot. The little skirmisher makes these holes, and the farmer calls it a Sapsucker. And such it is. Dr. Coues, however, says it is not a bird, handsome as it is, that you would care to have come in great numbers to your garden or orchard, for he eats the sap that leaks out through the holes he makes in the trees. When a great many holes have been bored near together, the bark loosens and peels off, so that the tree is likely to die. The Sapsucker also eats the soft inner bark which is between the rough outside bark and the hard heart-wood of the tree, which is very harmful. Nevertheless the bird does much good in destroying insects which gather to feed on the oozing sap. It sweeps them up in its tongue, which is not barbed, like that of other woodpeckers, but has a little brush on the end of it. It lacks the long, extensile tongue which enables the other species to probe the winding galleries of wood-eating larvæ. Mr. William Brewster states that throughout the White Mountains of New Hampshire, and in most sections of Northern Maine, the Yellow-Bellied Woodpeckers outnumber all the other species in the summer season. 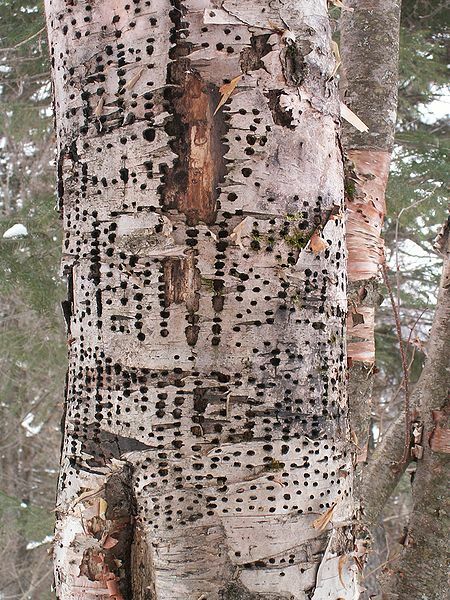 Their favorite nesting sites are large dead birches, and a decided preference is manifested for the vicinity of water, though some nests occur in the interior of woods. The average height of the nesting hole from the ground is about forty feet. Many of the nests are gourd-like in shape, with the ends very smoothly and evenly chiseled, the average depth being about fourteen inches. The labors of excavating the nest and those of rearing the young are shared by both sexes. While this Sapsucker is a winter resident in most portions of Illinois, and may breed sparingly in the extreme northern portion, no record of it has been found. A walk in one of our extensive parks is nearly always rewarded by the sight of one or more of these interesting and attractive birds. They are usually so industriously engaged that they seem to give little attention to your presence, and hunt away, tapping the bole of the tree, until called elsewhere by some more promising field of operations. Before taking flight from one tree to another, they stop the insect search and gaze inquisitively toward their destination. If two of them meet, there is often a sudden stopping in the air, a twisting upward and downward, followed by a lively chase across the open to the top of a dead tree, and then a sly peeping round or over a limb, after the manner of all Woodpeckers. A rapid drumming with the bill on the tree, branch or trunk, it is said, serves for a love-song, and it has a screaming call note. During the long summer days, when you were enjoying golden vacation hours, I often took a peep at you from some dead tree limb or the side of a hemlock or beech. You saw me, perhaps, and were surprised at my courage; for other small birds whose voices you heard, but whose tiny bodies escaped your young eyes, appeared very timid in comparison. But I am not so brave, after all, and know full well when my red hat is in danger. I am a good flyer, too, and can soon put a wide space between myself and certain wicked boys, who, I hope, by next vacation time will have learned so much about us that they will love every little feathered creature, and not seek to do them any harm. Can you guess why I have such a queer name? I really ought to be popular in Illinois, for they tell me it is called the Sucker State, and that the people are proud of it. Well, I am called Sapsucker because much, if not most, of my food consists of the secret juices which flow through the entire body of the tree which you probably saw me running up and down and around. But you saw me, you say, very often on dead branches of trees, and surely they had no sap in them? No, but if you will look closely into my actions, you will see that I destroy many insects which drill their way into the wood and deposit their eggs. In my opinion, I do far more good than harm, though you will find some people who think otherwise. Then, again, if there is utility in beauty, surely I am a benefit to every one. One day I heard a lady say that she never saw my head pop up from behind an old stump without bursting into laughter, I looked so funny. Now I took that as a compliment; for to give pleasure to those around us, I have heard, is one of our highest duties. Next summer when you seek the pleasant places where I dwell,—in the old deadening where the trees wear girdles around them; in the open groves, where I flit from tree to tree; in the deep wooded districts, whence one hears the tinkling ripple of running waters, you may, if good and gentle, see pop up behind a stump the red hat of Sapsucker. Range—Eastern North America; breeds from Massachusetts northward, and winters from Virginia to Central America. Nest—About forty feet from the ground. This article is from Birds Illustrated by Color Photography, 1897. We have been revisiting the birds and giving more current information about them. 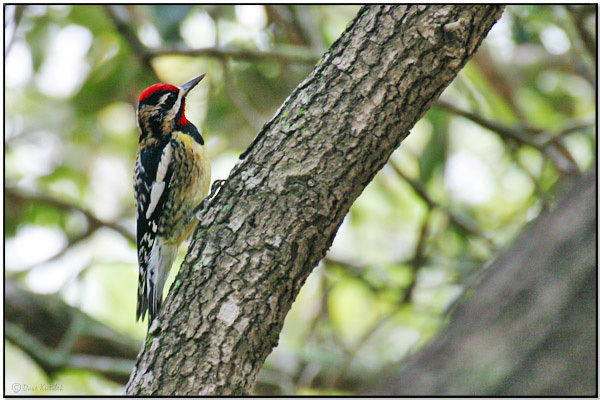 The Yellow-bellied Sapsucker is one of 232 species in the Picidae – Woodpeckers Family. 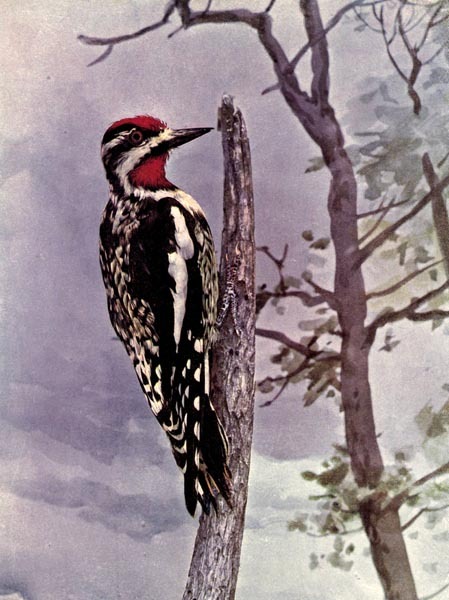 The yellow-bellied sapsucker is a mid-sized woodpecker, measuring 7.1–8.7 in (18–22 cm) in length, 13–16 in (34–40 cm) in wingspan and weighing from 1.4–2.2 oz (40–63 g). Adults are black on the back and wings with white bars; they have a black head with white lines down the side and a red forehead and crown, a yellow breast and upper belly, a white lower belly and rump and a black tail with a white central bar. Adult males have a red throat; females have a white throat. The red-naped sapsucker is distinguished by having a red nape (back of the head). The hairy woodpecker has no red on the crown (front of the head) or throat and has blacker back. The downy woodpecker has same markings as the hairy woodpecker but is significantly smaller. This entry was posted in Birds, Kid's Section and tagged Birds Illustrated by Color Photography, Birdwatching, Christian, From The Past, Home School, Kids, Nature, Photography, Picidae, Sapsucker, Vol 2 #4 Oct 1897, Youth. Bookmark the permalink.